Why Does Blac Chyna and Amber Rose Succeeds? Blac Chyna and Amber Rose have been around for rather a long time. Never mind that they were once strippers, but they have developed themselves into mommy moguls with a mission. “Respect or be Disrespected.” The pettiness with these two have always been on an exceptional level and I am here for it altogether. 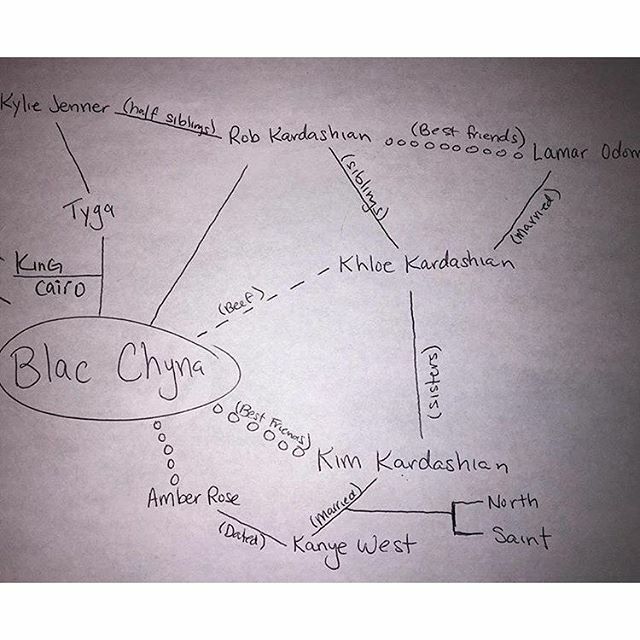 Now everyone knows how Amber and Chyna have been entwined and clipped from the Kardashian Family tree, here is a diagram (courtesy of The Shade Room Inc ) down below. Black Chyna was once allied with the Kardashian Klan. Kim, Khloe, Kourtney, Kylie, Kendall, and Kris. Real close friends actually. While being friends with Kim, Chyna was also friends with Amber Rose. 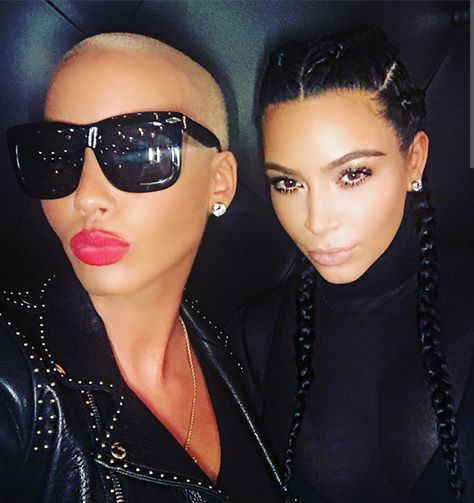 Amber Rose not only bear a birthday in common with Kim, but she was also with Kanye before he married Kim. (Hold on. It gets crazier) While being friends with both Kim and Amber Rose, Chyna was being double-crossed by her son Cairo’s father and her friend’s baby sister Kylie. Rumors started to spin that Tyga was getting a little frisky with little miss Jenner which put a very bad strain on the friendship between Kim and Chyna. Skip forward to the present day. Amber Rose and Blac Chyna win because they just don’t give a damn. They don’t care that they are called strippers, they don’t care that they have bodacious bodies that are always called “Fake”. They just simply didn’t care. Black Chyna is a businesswoman who owns several businesses, including The Lash Bar and Blac Velvet (at one time known as Fin 88) and also does hundreds of club appearances a year. The same works for Amber Rose, between club appearances, TV and Radio interviews and a very successful “Slutwalk” last year in LA, both Chyna and Amber has found their place in the industry to keep the coins coming. Still, both women have had public fallouts with their Exes, Wiz Khalifa, Kanye West, and Tyga. But throughout it all, both women manage to stand united in pettiness. I didn’t like what Kanye had said about Amber, in fact, I considered it was very hypocritical of him, especially in the light of Kim’s infamous blockbuster hit featuring Brandy’s little brother. But without missing a beat, Amber got her fingers in twitter mode and snapped back at both Kanye and his wife Kim. I suppose out of the two women, Blac Chyna is the funniest and most petty. Petty in a humor sense, of course. Only at one point, Chyna was not laughing, especially in the light of her son Cairo’s father Rapper Tyga, leaving for 18-year-old Kylie. (17 at the time.) But when the pettiness spilled over to Instagram, we totally got an eye and ear full. Tic for Tat can’t even begin to describe the on and “on” battle between lil Miss Jenner and Chyna. Yet, it wasn’t until Chyna went on twitter and tweeted, “Patiently waiting… four more months 😈” which started a mental countdown with everyone in mind of Kylie’s 18 birthday soon approaching, that the battle stopped. Threats usually trump petty posts. Chyna wins. If you are not in luck to have a bestie you can not only have fun but be petty with, then find yourself one. From twerking together to shading together to plotting together, Chyna and Amber has done the up-most with one another. And I have enjoyed it all the way. Only since I begin writing this post, it has been established that Blac Chyna and Rob Kardashian are now dating. But before that relationship got out in the open, Amber has been seen following certain Kardashian members on Instagram, specifically Scott Disick and then Khloe Kardashian. However, between the following spree of Amber and the happily ever after with Blac Chyna, Kanye West and Wiz Khalifa’s old beef got reignited when Wiz made a comment on the change of Kanye’s latest EP from SWISH to WAVE. Kanye didn’t take that all too well, once again taking shots at Wiz’s musical accomplishments and his EX wife, Amber Rose. But like the legend she is to be, Amber had her own bomb to throw, by alleging that Kanye West likes a little help from Patty the palm and her five friends. Days after the union of BLAC ROB has been social media blessed this happened.. Yes! The picture that shocked the world, the social media world. And as pictures are worth a thousand words, it is safe to say that Kim and Amber has called a truce. Yesterday, Kanye tweeted that he too has called a truce and made amends with Wiz. POST A PICTURE KANYE, OR IT DIDN’T HAPPENED! At the end of the day, you don’t have to take the road Chyna and Amber has. You don’t have to be a stripper (Ain’t nothing wrong with that), date rappers or even get into twitter battles with people. But you will always have people who will try to belittle you, degrade you or try to make you feel less of yourself, but both Amber and Chyna has shown that they are both strong enough women to defeat anything throw their way. And really, what’s wrong with that? Such a fuckboy move for Kanye! Love the diagram! 🙂 It’s confusing, the diagram helped!